Summer is here so there have been a lot of customer agate finds. This first photo was sent to me from Jennifer Jackman. She and her husband love to agate hunt. You can see photos of their adventures at www.lakesuperiorrocks.net. Pictured below is a nice agate they found earlier this summer in the Munising area. The next agate was found by Shea Cullum at a gravel pit near Moose Lake, MN when we were there for Agate Days. Shea is the grandson of agate friends, Gerald and Jill Phillips. For his young age he is already a good agate hunter! While at Moose Lake, Kate Terres from Minnesota came to my booth and asked me about a rock. As soon as I saw this wonderful tube agate, I asked her if I could put it on the web page. I received an email from Rhonda Riebow a week or so ago. She and her husband, who are from DeWitt, MI, visited the museum and purchased the new agate book. 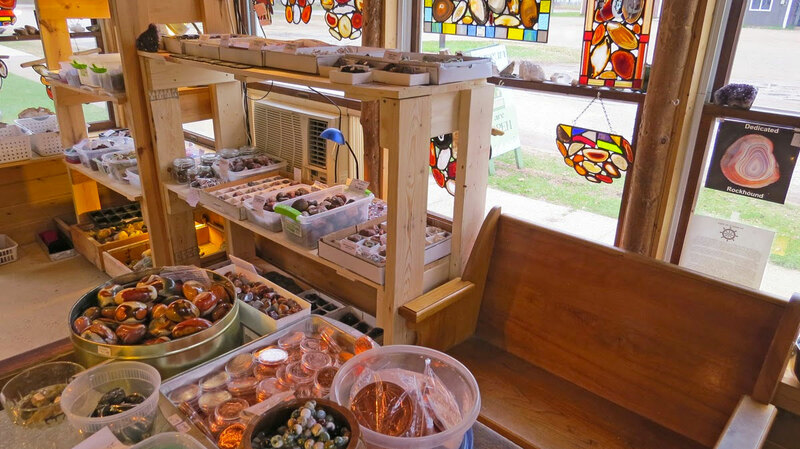 In her email she said that the book helped her to “think like an agate,” after which she found a handful of agates in the Muskallonge Lake area, located 20 miles east of Grand Marais. She has sent the larger flat agate to me for face polishing. The final agate featured this month is one found by Matt Kaufman. He and his family attended my agate lecture the other night. After I was done with the lecture, Matt came up to me and asked about a rock he had found east of Grand Marais. He found it in three feet of water just off shore and was not sure if he wanted to carry it back to the car. We are all glad that he did! There is botryoidal formation on one end, obvious pseudobands showing through the husk on top, a lot of translucent carnelian, and curlicue formation on the other end. Although there is not obvious concentric banding showing, it is still a terrific 3.5 pound agate! Congratulations Matt!